Having said this, there is one piece of film footage that shows the flag rotated in the opposite direction. The flag is now oriented so the whole flag can catch the light from this filming position of the LM window. The footage lasts for about 40 seconds and is broken up into 4 separate pans. It is on one of the DAC films. The footage runs from about the 25 second mark to 1:35. The best view is the 45 second mark. Because there was a test firing of the RCS, which impinged on the flag. Look for the transcript on Apollo Lunar Surface Journal. serted in the lunar surface. That seemed to hold alright, but I noted later after getting back into the LM that the weight of the flag had rotated the entire unit about the flagpole axis such that the flag was no longer pointed in the sane direction as it was originally. I suspect that the weight of the flagpole probably had shifted its position in the sand a little bit from the position where it had originally been installed." 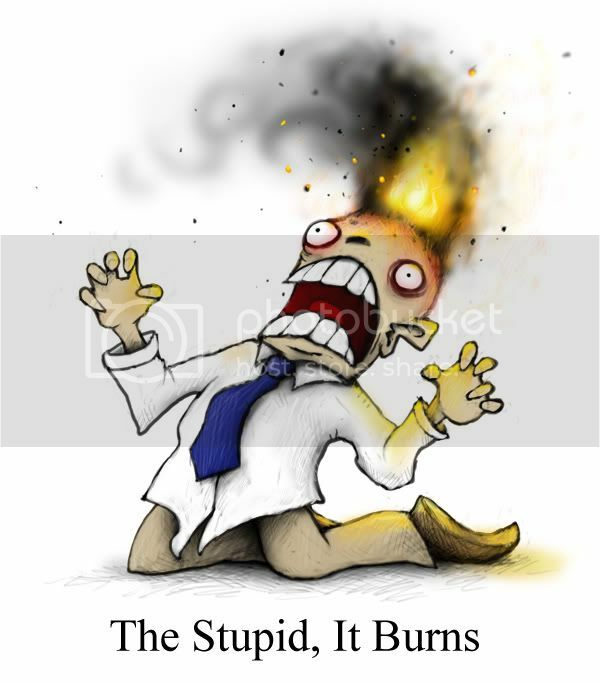 It's not completely clear whether the RCS hot-fire test was before or after Armstrong's noticing the flag had moved. On another mission (can't remember which one) the depressurisation of the cabin before the dumping overboard of the PLSS backpacks may also have moved the flag. Thanks for the replies. I have read the surface journal in the past. The editors of the journal are just guessing and trying to rationalize how the flag changed direction. In fact, they went as far as implying Armstrong didn't know what he was talking about when he suggested he saw the flag had moved when he got back in the LM. Who are we suppose to believe? Armstrong or some guys writing about it 30 years later? The issue, of course, is Armstrong's comments can't be correct due to the existence of the post EVA photos showing the flag in the original position. So the question still remains. When did the flag change? And another thing to contemplate is why did they do 4 short pans of the same thing. In all the missions, very rarely did they take multiple shots or pans of the same thing. It was usually one shot, done, and move on. A bit odd given the (photo) camera they were using didn't have a viewfinder. Thanks for your input. If a thing happened THIS MORNING, there will still be gaps and inconsistencies as we try to reconstruct it. Bolded is not correct. They interview/debriefed the crews after each mission so the comment are from the individual memories of the astronauts. You stated that they were attempting to use up magazines. Pans used a large number of shots in a short period of time. Nothing suspicious to a reasonable person unless you are JAQ leading to "I don't understand, therefore it is fake/fraud etc. 112:20:56 Aldrin: Roger, Houston. Tranquility Base. We're in the process of using up what film we have, and I'm just getting ready to change the primary ECS canister. Over. 112:21:14 McCandless: Roger, Tranquility. We'd like to hold off as long as possible on the lithium hydroxide canister. Make that one of the last things you do in getting ready for the Depress, if you can. Over. 112:21:31 Aldrin: Roger. We're planning on doing that. I was just wondering how much longer we want to wait, though. We've probably got another half an hour's worth of picture taking, and I guess we could run through an eat cycle and then change the canister, and then Depress. Over. 112:21:56 McCandless: Roger. That sounds fine to us. 112:22:02 Aldrin: Well, it'll be a little crowded in here for a while. 113:17:52 Armstrong: Roger. We just finished up...We're just finishing up our eat period. Be ready to go back into Prep for Depress. So that means the photos were taken over at least 30 minutes ending at roughly 112:52, and before they ate. They were using up the films instead of leaving them blank, and Aldrin would have been doing the same with the DAC camera later, so he could put a fresh magazine in for the liftoff. 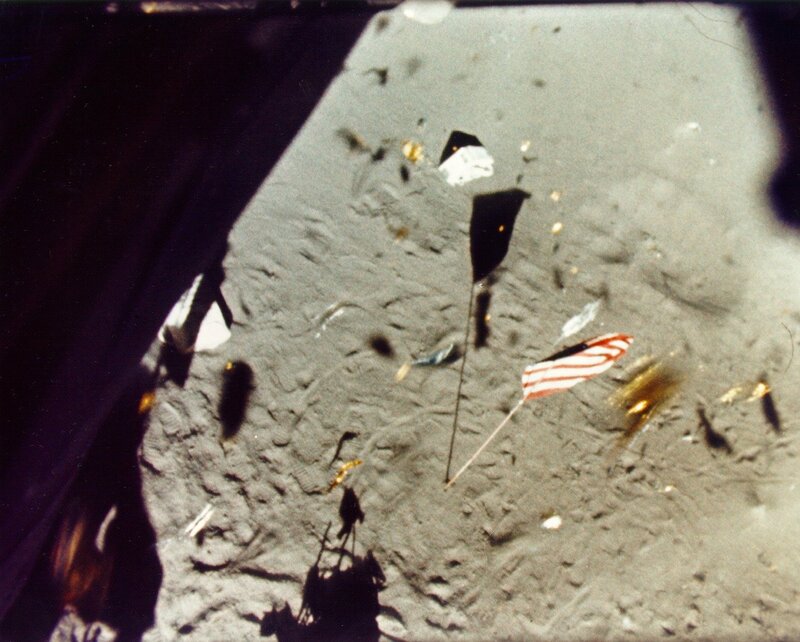 Note that in Armstrong's statement about the flag, he is only pointing out that he saw it had changed afterward when in the LM, meaning not during the EVA and probably not immediately after getting into the LM either, which might have been impossible anyway until he and Aldrin doffed their helmets and PLSSes. So there's no inconsistency between what he said and what we see in the photos. I don't see any big mystery here. Good job, Kiwi I don't see any problems either. These images were clearly taken from different windows, the left from Shepard's window the two right images from Mitchell's window. The flag indeed does seem to change but this is from perspective. Nothing suspicious here unless you closely look at the original poster's poor image analysis knowledge. I think the point is not the difference between the left and middle image, which is indeed perspective as a result of being taken from different windows, but the middle and right image where the flag has clearly moved as a result of the RCS firing test. I agree with you Jason, I was attempting to present the perspective aspect to images that seem to be moved. There seem to be a lot of JAQ by our poster, and I don't believe he has really studied all aspects of the missions prior to raising his hand. EDIT to add: I should have used better description of the window middle right etc. in my previous post. These images were clearly taken from different windows, the left from Shepard's window the two right images from Mitchell's window. The flag indeed does seem to change but this is from perspective. Gotta disagree. The flag does change position, but only because the DAC is rotated anticlockwise. When I looked at those three I believed they were all taken out the same window, but in case I was wrong, checked the caption of the left-hand one, AS14-66-9338, and indeed, it was taken by Ed, and the surrounding ones prove it was -- see also 9337, 9338 and 9340 and their captions. The tracks of the MET match up among all three. A photo taken out of Al's window would be unlikely to catch the shadow of the right-hand RCS thrusters and (I think) plume deflector, which we can see at bottom left of 9338 and at the top of both centre and right shots. Also there's the large and two small multiple craters almost at the top of the flag in AS14-66-9338. They are further to the right in the other two. Then there's the shadow of the S-Band antenna in both left and centre photos of the trio. Because the antenna was blown away by the test, it's not in the right-hand shot. One thing some people might miss in the three shots, and initially had me fooled until I properly analysed things, is that the DAC camera is looking through a different part of the window and possibly closer to it, but most of all it is pointed further down and rotated anticlockwise about 55 degrees. Check it out -- the only real difference between first and second photo is the different view and the rotation. PLSS behind plume deflector? Same place, both are just rotated clockwise. Three cat's-claw shadows with two touching flagpole shadow? Same place, just rotated up. Piece of equipment beyond flag shadow and casting triangular shadow? Same, rotated to top centre. Shadow of tiny sharp crater just above MET shadow? Same, both are just rotated. Darkest shadow in S-Band antenna shadow almost touching tiny crater? Same. Rock at 3 o'clock from flag? Same, right on the edge of the DAC stills. Flag and flagpole shadows? Rotated to almost where the flag was. Carry on and you'll find more. I'm not see the camera rotating, probably moved from middle to right, but I'm not seeing the rotation. ...I'm not seeing the rotation. Are you keeping in mind that camera rotated anticlockwise, right side up, left side down, equals scene rotated clockwise? Right side down, left side up. Just compare the flag, its pole and and its shadow and the piece of equipment on the ground above the shadow. If you could place them over the centre DAC photo with the base of the pole aligned, you should be able to see that clockwise rotation of the DAC photos. Many photo viewers allow image rotation -- I use the marvellous freebie IrfanView and it does.